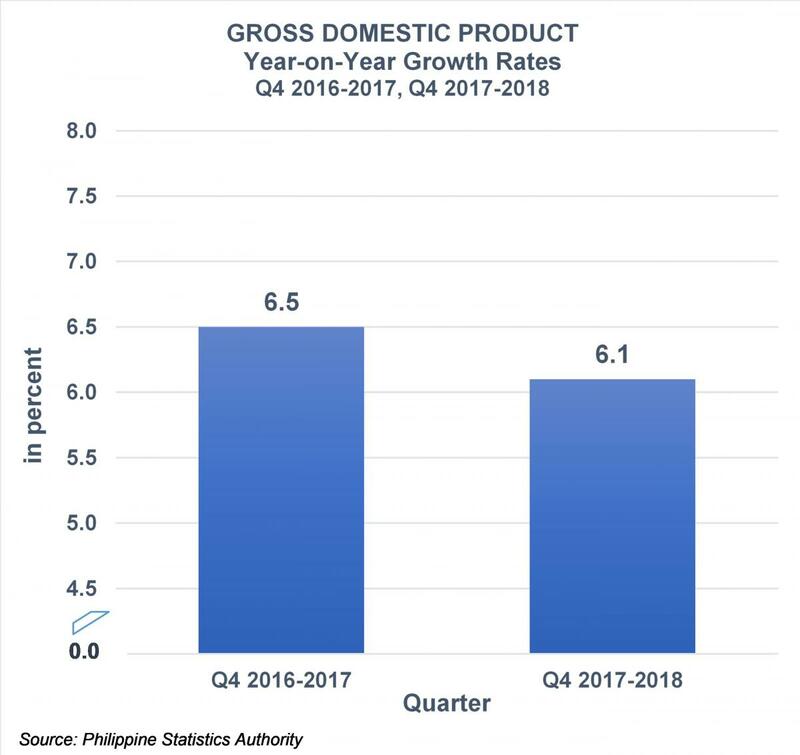 Gross Domestic Product (GDP) posted a 6.1 percent growth in the fourth quarter of 2018, resulting in the 6.2 percent full-year growth for 2018. The main drivers of growth for the quarter were Construction; Trade and Repair of Motor Vehicles, Motorcycles, Personal and Household Goods; and Other Services. Among the major economic sectors during the fourth quarter of 2018, Industry had the fastest growth, with 6.9 percent. This was followed by Services, which grew by 6.3 percent, and Agriculture, by 1.7 percent. Net Primary Income (NPI) grew by 0.9 percent. As a result, Gross National Income (GNI) posted a growth of 5.2 percent. On an annual basis, GNI grew by 5.8 percent, while NPI’s growth is at 3.7 percent. With the country’s projected population reaching 107.0 million in the fourth quarter of 2018, per capita GDP and per capita GNI grew by 4.4 percent and 3.6 percent, respectively. Meanwhile, per capita Household Final Consumption Expenditure (HFCE) grew by 3.8 percent. See more at the National Accounts of the Philippines main page.